The Food Network chef whose style I can relate to the most is the Barefoot Contessa (Ina Garten). She loves to entertain friends and cook for her husband but doesn't like complicated recipes or spending more time fussing over the meal than with those she is cooking it for. Her mustard roasted fish is a classic example of something that looks and tastes more extravagant than it is. I make it all the time served with rice and veggies. It literally takes about ten minutes to prep and another 15 minutes to roast. If you start your rice and veggies before you start the fish, everything should be ready to serve together in about a half hour tops! There are a few adjustments I make when I cook mine. 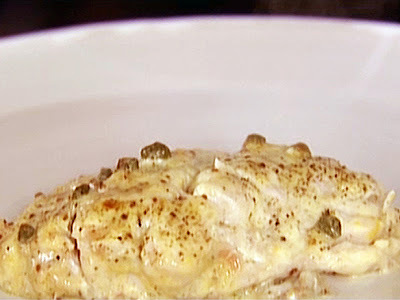 I put only 1/2 teaspoon of salt in the creme fraiche mixture, I add a lot more capers because I really like them and instead of putting the oven on "bake", I put it on "broil". There are many things you can substitute the red snapper with. I use swai most often, it's a relative of the catfish. I'm going to try talapia out tonight. Chicken works great as well but make sure you flatten out your pieces first. Pan sear them until you get a nice brown color. About 3 minutes per side. THEN put your creme fraiche mixture on top and bake for 15 to 20 minutes depending on thickness of your chicken. If you can't find shallots, use onion instead. The results are just about the same. You can buy ready made creme fraiche or you can make it yourself. 1. 1 cup whipping cream mixed with 2 tablespoons buttermilk. 2. Combine well in glass jar and cover. 3. Let stand at room temperature (about 70 degrees F.) for 8 to 24 hours, or until thickened. 4. Stir well and refrigerate. 5. Use within 10 days.